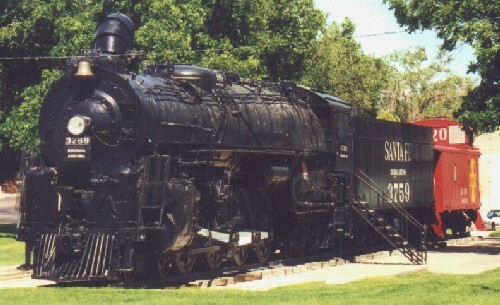 This Santa Fe Northern-type locomotive is in the town's park on the main street, street name - route 66? Across the eastbound lanes from the park is a converted industrial building which houses some giftshops and a very good 50's style ice cream parlor. The BNSF mainline runs along the parking lot of the building and splits into the North and South tracks for the westward run to Harris. We recommend stopping here for awhile to enjoy the railroad, ice cream, and old hot rods, just remember to bring lots of film! A BNSF 9-44CW leads some older GE's on a westbound general merchandise. Judging by the carbodies on the trailing units, a C36-7, C40-8, and a BN C36-7. A Santa Fe C40-8W and 9-44CW lead a Burlington Northern SD40-2 on a westbound double stack train.